When a bad game sells well, expect a sequel. But should developers ignore the criticism of the first game when they come to craft the follow up? You'd think it would be an unwritten rule that if you're creating a game based on existing property you'll include the things that make the license recognisable. HeadGames Inc clearly hadn't read this particular rule book when they created a follow up to the 'Taz Mania' game. 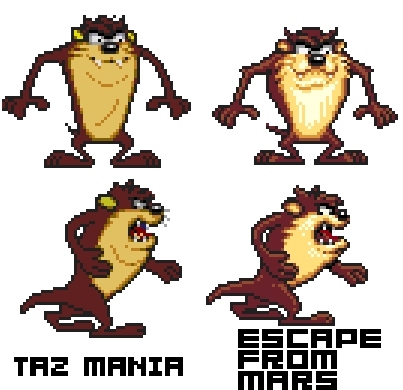 'Taz in Escape from Mars' includes only the main character and everyone else from the 'Taz Mania' TV series have been left behind; indeed the titular location of "Tazmania" is hardly featured. Instead the game (initially at least) moves the action to Mars and designers have created their own story to somehow justify this. 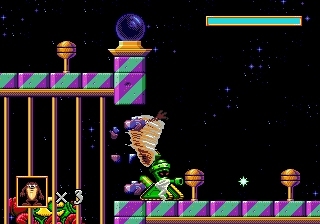 The game starts by showing Marvin the Martian capturing Taz for his intergalactic space zoo. But bars will not contain a Tazmanian Devil and Taz escapes; determined to get revenge on his captor. Naturally the story is very different to the first game which simply had Taz hunting for a large egg. While Critics all saw the bizarre narrative shift between the two games, they couldn't seem to agree as to why it had happened. EGM felt it was a conscious effort to distance the sequel from its predecessor as "The first Tazmanian Devil game wasn't all that hot". GamePro instead implied that the inclusion of Taz was to add gloss to a mediocre game that otherwise wouldn't sell. "If it weren't for Taz, this game would just be another jump-n-bump adventure" they noted in a review. The problem is that 'Taz in Escape from Mars' is a "one step forward, two steps back" sequel. The original pretty ropey prequel still echoes through it despite the location change. As such hardly any of the first game's shortcomings are addressed. Instead even more problems are added since HeadGames Inc seem to have had a desire to shoehorn in as many game mechanics and level locations as possible. Reviewers at the time were quick to notice that this sequel has been inspired by another Mega Drive title. "'Taz in Escape from Mars' borrows heavily from a certain blue hedgehog's series of games" noted All Game Guide. Like 'Sonic the Hedgehog', 'Escape from Mars' is a fast-paced platformer with bizarre level layouts that you just move through without really knowing where you're going. However unlike 'Sonic' with its tight responsive controls even running and jumping in 'Escape from Mars' is hard to do. Taz was difficult to manipulate in the first game but if anything things are worse in this sequel. Like the first game 'Taz in Escape from Mars' has a three button control scheme; one jumps another performs an action like eating food and the last does Taz's iconic spin. As in the prequel this spin acts as his primary attack. In principle it sounds simple but it has been terribly executed in the game. Some may argue that in the 'Taz Mania' cartoon series Taz doesn't move very elegantly, indeed jokes are built around this. However what's funny in a TV show fails to amuse in a video game. A platform game quickly becomes an awful experience if it's hard to jump between platforms, after all that's what you're doing most of the time. This is clearly the biggest fault with 'Escape from Mars'; the basic controls are intrinsically broken to the point that every character movement is frustrating. It is all made worse when Taz starts spinning or moving quickly; something he seems to be programmed to do at every opportunity. Unless Taz picks up some rocks or drinks a can of petrol, the only method he has to attack is with his spin, but, as you'd expect, it's tough to keep him under control when he is spinning so recklessly. You'll find you accidentally destroy helpful items, plummet off ledges and inadvertently backtrack through a level simply because it's impossible to control your character with any precision when he is doing what he is predisposed to do naturally. Again you could argue that it's true to Taz's character in the TV series so maybe these controls could have been a deliberate design choice. However when the developers seem to have abandoned everything else from 'Taz Mania' keeping the one thing that ruins the gameplay of your game wouldn't be a very logical design decision. To be frank, this game is almost un-playably frustrating and it's made worse by there not being consistency with the way the level environments behave. 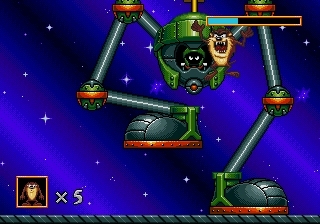 Pipes for example can be followed by a spinning Taz even if they run vertically up the screen, however the same feat of gravity defying can't be achieved with normal walls. It's a shame as there are some great ideas in this game, lost amongst awful jumping and frustrating design. 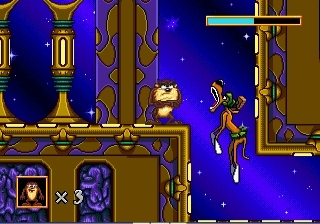 For example, at times Taz can grow in size taking up most of the screen. When giant he can plough through walls with ease. Similarly he can also shrink, sneaking through gaps that would otherwise have been too tiny for him to enter. This was years before Mario started munching on Mega mushroom, which Nintendo claimed was an innovation when promoting 'New Super Mario Bros' on the DS. Similarly when spinning around uncontrollably Taz can also burrow through some soft ground. It's a nice idea that has since been replicated in games like 'Drill Dozer' but digging is a headache rather than a treat. You can barely make out where Taz is under the Earth as only his eyes are visible. Another level sees Taz finding a Propeller device that allows him to fly. 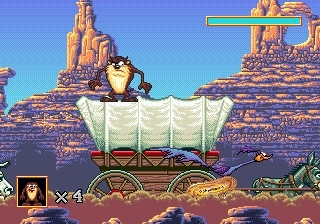 It's a section that actually plays like a swimming stage where holding the spin attack button causes Taz to rise in the air. The problem is letting go of this button makes him plummet and there's no way of defending yourself when in flight. Without luck on your side you can't progress as the only route through the maze like level sees you coming into contact with projectile firing enemies. A later stage introduces yet another gameplay style where you race Yosemite Sam to the front of a moving cavalcade. Leaping from coach to horse to cow sounds exciting but the reality is it's just an endless stream of leaps of faith; jumping towards the edge of the screen hoping you'll land on something. Thankfully it's all over in a couple of minutes. It’s to the developer’s credit that they're trying to integrate new ideas into the game but they're all so badly made. It feels like all ideas, regardless of how enjoyable they are to play, were included. Some things work better on paper than in practice and 'Taz in Escape from Mars' is a hotchpotch of ideas and most make the game feel needlessly gimmicky. However, excessively design ideas aren't limited to just the contents of the levels. The stage environments also feel the result of a design free-for-all. 'Taz in Escape from Mars' is a hugely deceptive title. Taz achieves this goal when he defeats a boss fifteen minutes into the game. At this point the game seems to go into free fall and there seems no logic to the level locations. After visiting a planet of Moles, Taz also pops along to a haunted house and Mexico. Of course there are hundreds of platform games that feature abstract and unusual level locations, but these aren't named after the first fifth of the game. There are parts of 'Taz in Escape from Mars' that feel like they belong in a different game; bodged into this title to make it last longer. At least the characters Taz meets in the varied locales hail from the Looney Tunes universe even if they're not from Taz's 'Taz Mania' series. It's always nice to see familiar cartoon characters but it seems like few fans would have bought the game just to see them, given that it was presented as an adventure on Mars. Despite the settings continually changing the game surprisingly doesn't look offensive, though it's not particularly incredible either. The main sprite is very similar to the one featured in 'Taz Mania' although it's slightly more detailed. At least this time all the frames of the run animation have been included. The end of level guardians are good and fill the screen, the problem is that with size comes slow down which rather dilutes the overall effect. The backgrounds are hit and miss. Some have an impressive number of layers creating the illusion of depth, others are simply solid black. I find it amusing that critics seemed enamoured with the visuals at the time. "Graphics-wise, this game could only be better if it were drawn by Fritz Freling himself" Games Players magazine claimed. "The characters would fool your mom into thinking you were watching TV and not playing a game. " let's not forget that this game came out in 1994, after 'Gunstar Heroes', 'Sonic the Hedgehog' and 'World of Illusion'. It seems ludicrous that people would consider this attractive compared to these beautiful games. Electronic Gaming Monthly were more accurate in their appraisal saying "The visuals need some help as they are too simple, even [the ones] from the cartoon". Thankfully the awful audio that blighted 'Taz Mania' has been lost here. While 'Taz in Escape from Mars' doesn't have a soundtrack you'll listen to on your phone while riding the train at least you can hear the melodies over the jump noise. That being said it's a slightly odd collection of songs that all seem to have spacey alienesque undertones even when you're playing the Mexican levels. It feels almost as if the soundtrack was composed before the designers decided to throw every idea they had at the game. Video Games and Computer Entertainment had a slightly forgiving view when it came to 'Taz in Escape from Mars'. "So maybe this isn't 'Sonic the Hedgehog' But who cares?" They wrote. “It’s another pretty fun platform game". Considering this game originally retailed at close to £50 you would have to wonder who wouldn't care that they were spending so much on a game that was so sub-par. The All Game Guide Journal pointed out that 'Taz in Escape from Mars' was "not as lengthy or as clever as the 'Sonic' games". So considering it's also less attractive and infuriating to play it's pretty clear that if you want to play as an Animal that spins, your best bet would be sticking with a blue Hedgehog rather than a carton Tasmanian Devi. If nothing else 'Taz in Escape from Mars' shows that a bounty of ideas really is no good if none of them are implemented very well. It would be a much better game if the designers had just focused on getting the basic jumping and spinning mechanic working. When Head Games Inc. had a whole TV series to draw from its perhaps slightly unfortunate that the only thing they preserved from Taz's Nineties rebirth was the one character trait that simply isn't wanted in a video game character. 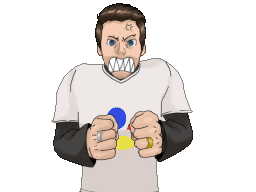 An uncontrollable personality might be hilarious when watched in 'Taz Mania' but it really does make for a pretty poor game. 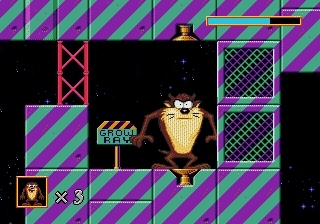 After ‘Taz Mania’ I certainly wouldn’t have chosen to buy another Tazmanian Devil game for the Mega Drive. Like most of my games ‘ Taz in Escape from Mars’ was chosen for me by the previous owner who sold all his games to me in bulk.